About 11,000 years ago, the region's ecological zones were one thousand feet lower in elevation than today due to the cooler and wetter weather patterns of the waning Ice Age. Streams flowed and lakes existed where dry playas are today. The relative abundance of plant communities supported wildlife and indigenous peoples who depended upon the natural resources. While clear archaeological evidence of human presence in this early time are sparse, over 1,300 later prehistoric and historic period archaeological resources have been recorded for the large Preserve area, including 65 rock image sites. Museums and professional researchers have made significant collections of artifacts since 1925. In general, these tribal peoples occupied the lands as small, mobile social units of related families who traveled in regular patterns and established summer or winter camps in customary places where water and food resources were available. Archaeologists named a series of five manifestations of Native American occupation, which were believed to describe changes in climate, chipped stone technology, and subsistence practices of these early peoples. These periods covered time intervals from about 5000 BC to AD 700-900. At that point, the Mojave desert area, unlike other portions of California's desert region, was influenced by native peoples now called 'Ancestral Pueblo' who established farming villages along the Muddy, Virgin, and upper Colorado rivers. Their culture reached into today's Preserve lands at turquoise sources and via trade trails as far as the Pacific coasts. Later, however, Ancestral Pueblo peoples abandoned their territory and were replaced by Shoshonean and Paiute peoples after about AD 1000. In addition, native peoples of the lower Colorado River basin speaking Yuman languages expanded their river zone territory and utilized some desert lands as well. 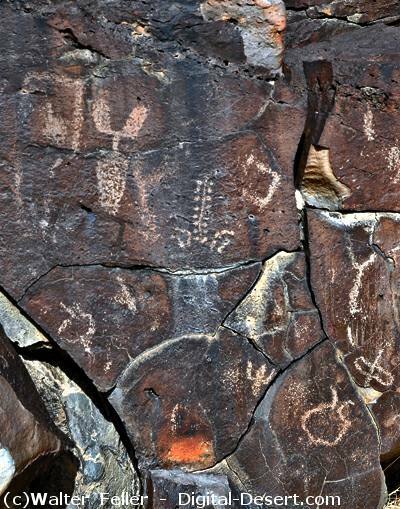 While the Chemehuevi were the primary inhabitants of the area now encompassed by the Preserve, the desert and the park itself are named for a different group of Native Americans - the Mohave. The Mohave were agriculturalists who planted in the flooded plain of the Colorado River. This agricultural lifestyle generated food surpluses, which enabled them to support a sizable population in the river basin area, numbering in the thousands. The Mohave frequently traded with other Native American groups to the west and east, and had a particular fondness for seashells traded by Indians on the California coast. The Mohave had a network of trails across the desert from waterhole to waterhole. The Mohave bragged to early European visitors that a powerful Mohave runner could make the trip to the Pacific coast, more than 150 miles long, in three days. The Mohave guided some of the first non-Indian travelers over this network of trails, including friar Garc�s in 1776 and American trapper Jedediah Smith in 1826. Their network of trails, now known as the Mojave Road, became one of the main routes used by the government and other travelers to cross the desert before the advent of the railroad. Later attempts proved more successful at opening the cross-desert route now known as the Mojave Road. Between 1855 and 1857, the General Land Office surveyed township lines throughout the area. This effort was largely wasted when the location monuments could not be rediscovered by others, but the small number of people on the surveying teams became very familiar with the desert and later served as guides for other expeditions. In 1857, Edward F. Beale surveyed a wagon road across the Arizona desert, and crossed the Mojave along the route of the future Mojave Road. Combined with his eastbound crossing in 1858, Beale's success proved the viability of the wagon road. 1 Lorraine M. Sherer and Frances Stillman, Bitterness Road: The Mojave, 1604-1860 (Needles, CA: Mohave Tribe / Ballena Press, 1994). I am indebted to Roger Kelly, Senior Archeologist, NPS Oakland, for much of the information and wording in the preceding paragraphs. Comments by Roger Kelly on first draft, June 25, 2002. For information about Chemehuevi songs, consult Carobeth Laird, The Chemehuevi (Banning, CA: Malki Museum Press, 1976), 9-19. 2 Chester King and Dennis G. Casebier, with Matthew C. Hall and Carol Rector, Background to Historic and Prehistoric Resources of the East Mojave Desert Region (Riverside, CA: Bureau of Land Management, California Desert District, 1981), 20. 3 Generally, the tribe and places named after the tribe in Arizona are spelled "Mohave," the fort in Arizona, the desert, and other places in California are spelled "Mojave." See Dennis Casebier, The Mojave Road, Tales of the Mojave Road #5 (Norco, CA: Tales of the Mojave Road Publishing Co, 1975), 182n1. 4 This incident was likely precipitated by violence toward the Mojave by an earlier trapping party, under the command of Ewing Young. Later trappers, such as Peter Skene Ogden, also massacred Mohaves without warning, contributing to the tension. Casebier, Mojave Road, 24-28. 5 Casebier, Mojave Road, 30-31. 6 Casebier, Mojave Road, 57-66.